If you are seeking a modest knit dress that's versatile enough to wear to church, to the office, or for an evening out, then William Riera may have something for you. The Utah-based company seeks to offer dresses that are modest and chic. During our visit to the company's website, we saw nine fashionable dresses on display, most of which featured high waists. 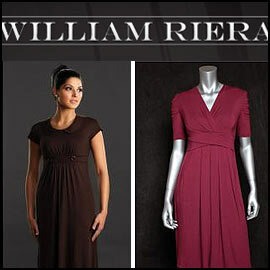 While the collection is currently somewhat small, there is this suggestion of growth: "We look forward to adding a wider selection of women's dresses, skirts, tops, and much more..." The current dresses offered by William Riera have classy, subdued colors such as black, "chocolate brown," and "raspberry."